We're on a mission - the Million Pledge Mission TM - to stop 1,000,000 drivers from texting and driving and make the roads across North America safer for all of us! You've heard the stats, the stories and the warnings about the dangers of texting and driving. Now it's time to do something to stop the hundreds of thousands of injuries and deaths caused by texting and driving every year. 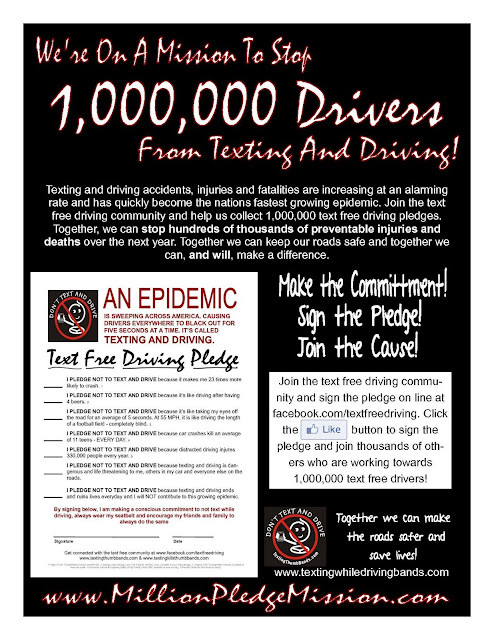 Start by signing the pledge and committing to be a text free driver. It's the right thing to do, and will help save lives! Go to http://www.millionpledgemission.com/ to sign the pledge on line, or download the pledge by clicking: Downloadable Pledge and then sign it and send it to pledge@millionpledgemission.com. After you sign the pledge, tell your friends and family to do the same. Join us in the fight to stop the biggest epidemic American Drivers have ever faced! Together we can make a difference!